This weekend the yearly European Software Conference (ESWC) took place in London (Great Britain). I gave a speech there about the “Intel AppUp Developer Program: the New App Store for Netbooks and Tablets” explaining the opportunities for developers when they submit their products in the AppUp Developer Program. In a short example I showed how an existent program can be prepared to be released inside the Intel AppUp app store. Download the PowerPoint presentation. 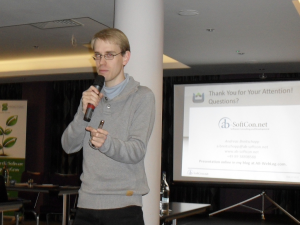 Did you attend the European Software Conference this year, too? This entry was posted in Development, Events and tagged AppUp, conference, Development, event, Intel, software, speech. Bookmark the permalink.